I am so excited and blessed to report that my mom just yesterday asked me if I would come home for Thanksgiving. This is not a gift I normally receive. I haven’t been out of Manhattan for any college Spring Breaks and I haven’t seen a Thanksgiving dinner in front of me since I was seventeen. She offered to pay for my ticket as my Christmas present, when I found the cheapest round-trip option. After booking on VirginAmerica.com (Expedia.com and Priceline.com show decent packages, but really do not have the best one-way prices, and therefore present far more expensive round-trip options than the sources themselves. Although, American Airlines’ quotes were outrageous outside the bargain websites. Try the airline site first, and then Expedia, is my conclusive advice.) – I’m lucky enough that Virgin flies for cheap from New York to LAX. You’re going to have an entirely different list of prices with less popular/busy airports – I’m all set to finish up my papers and research I have to do this week, and get packing! Hit up the website and put in your zip code. From my neighborhood, in the East Village, it will cost me alone $23.00 to get shuttled, with all my luggage, to JFK. And if I have friends traveling the same day, they’ll only have to pay $10 each. Both prices are way less than $45 + tip!! We’re also giving you 10% off (so -$2.30 for me). Or if your fare is less, use the coupon in our magazine for $2 off. So, I have actually been to Montreal, and I have actually eaten authentic poutine there! I ate a lot of it, scarfed it quickly, and was in the mood for some good eatin’ – which it delivered (meaning I wasn’t just tasting it for the heck of it). Poutine is one of those things that you know you could make or eat anywhere, but that you barely ever actually think about or taste. We kind of associate gravy with Turkey or Mashed potatoes all the time. We kind of associate cheese curds with – well, what do we associate cheese curds with? I can’t actually claim to know the answer to that one… maybe, rural, dairy-farming, excess product that becomes snack? I do not claim to be any sort of authority on that topic! Anyway, we don’t think “Frenches ‘n’ gravy,” much like we don’t think “chips ‘n’ vinegar,” as the Irish and English do. But I can report firsthand, and even think I know you can imagine, that French fries taste amazing with gravy. I really recommend trying them in New York City, because I know T-Poutine has an awesome reputation here, and the reason why is because they actually do taste quite like Quebec’s famous cuisine! You can’t go wrong with T-Poutine. 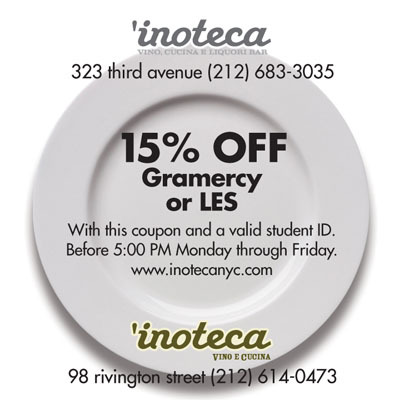 And now you have our coupon, so no excuses to not try that sort-of-exotic dish you’re curious about when you’re down on the Lower East Side. Senior year is about the time when I’m loving my city for all of its unique quirks, and I also can’t deny that I’m itching to see my geographically spread-out friends more often – I miss them. The great thing about Manhattan is that no American-born, or maybe even Earth-born, college-aged person can deny their interest in visiting this famous city. Even if laid-back Californians never want to move, trust me, they consider New York City entrancing and beautiful (all the way from their view of it thousand of miles southwest). People want to shop here, walk Central Park, learn why Brooklyn and the Bronx are so well-known. People want to see snippets of how the economy of America is stimulated by so much that goes on just within our island’s 22 square miles. Manhattan just is enthralling. Basically, it’s time to tell your friends to stop dreaming, and just visit already! I do. If anybody can help them float the ticket price (booking 3 months in advance will save about $300 on a round-trip ticket from L.A.), being here for a week will not break their bank. And I’m serious. If they can withstand the lure of the (overrated) Topshop that opened last spring in Soho, they do fine with just a few hundred for spending money and emergencies. And lodging! I’m sure that’s their second fiscal fear after flying. Manhattan hotels notoriously charge sky-high prices – even when you think them not nearly nice, clean, historic, cute, or legendary enough to do so! Tell your homies to stay in a hostel. For about $35 per person, per night, Jazz Hostels can’t be beat. Maybe you have to share a bathroom, but think about how much you save and where you can step out to when you leave to explore New York anyway! 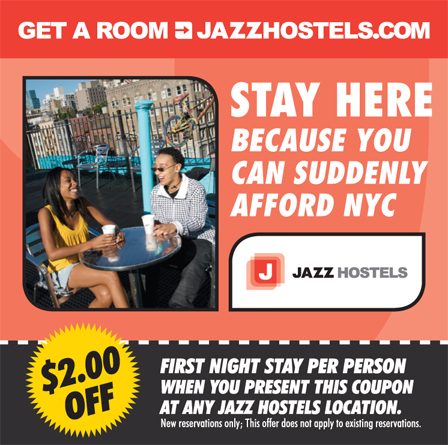 Jazz Hostels are located on beautiful Central Park West, in Times Square, in Stuyvesant Square near NYU, and several places uptown near Columbia University and Hunter College. I know so many New Yorkers and East Coasters who love their Italian food, and many who so cherish their Italian heritage. The thing about Italians being so abundant in NYC, though, is that pizza, pasta, vino and antipasto is everywhere. There are so many Italian restaurants and it is hard to find one you’ll really appreciate unless you have had it recommended to you by someone else who knows Italian food well. So, even though I’m not an expert, I am very meticulous with my food critiquing – in other words, trust my judgment! I’ve tasted my fair share of over-cooked pasta, bad wine, and antipasto that just doesn’t taste right. In conclusion, it makes me very happy to bring you the awesome menu at ‘Inoteca! This place exists up on 3rd Ave and down on Rivington, so whether you’re hitting up the Lower East Side nightlife, or further north with friends, definitely step in here for a delectable dinner and some nice companion wine, if you’re legal. Entrees are not too expensive, ranging from $11-$18, and our coupon gives you 15% off your whole dinner (so go on with that wine and appetizer, girl!). I love the mushroom Insalata and pesto Bruschetta. And if you just happen to be trying to learn Italian, get a leg-up on your practice with the menu and waiters!